I'm new to the Charley Davidson series, having only started last year, but I'm already a total addict. 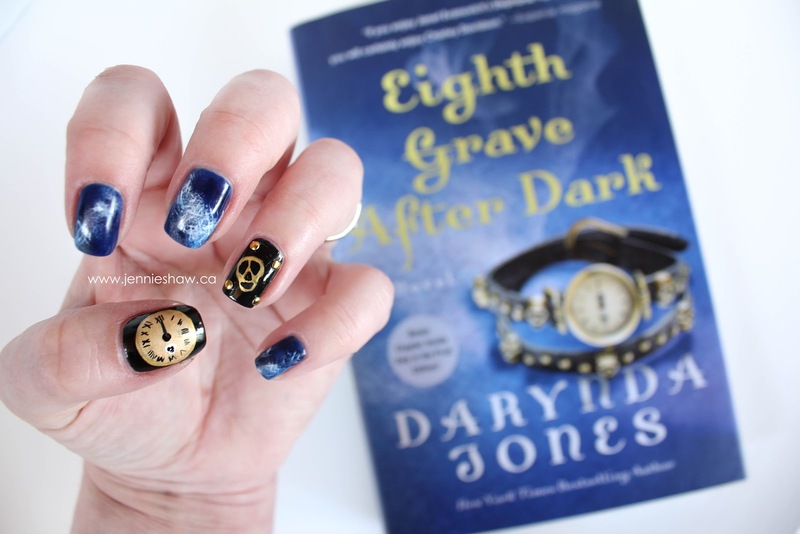 I read EIGHTH GRAVE AFTER DARK in a single day and loved it so much that I spent the following day figuring out my tribute mani. I won't lie; the mani nearly killed me, but considering the series, my struggle was actually quite appropriate. Haha! For those who aren’t familiar with the Charley Davidson series, let me break it down for you. Charley is a twenty-seven-year-old (when the story begins) private investigator who just happens to also be the Grim Reaper. Only she's more glittery than cape-y, which is one the many reasons I love her. Haha! So while she’s solving kidnappings or assisting the police with other investigations, Charley also helps the dead complete their unfinished business, and then lets them pass through her to the other side. As you can imagine, this keeps her quite busy. If you haven’t read the series before and it seems interesting to you, you’ve got a decision to make. 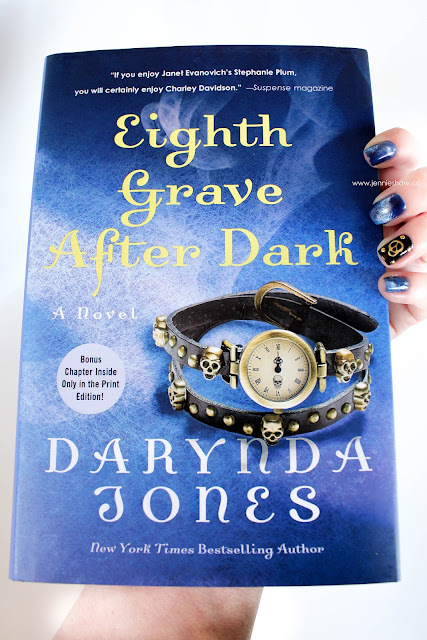 Because this is the eighth book in the series, there’s no possible way for me to talk about EIGHTH GRAVE AFTER DARK without spoiling a few things, so if you like to be surprised about every single component of a series and you’re feeling the conc, then you should probably stop here. As it's an important decision, I’ll just hang out for a second while you mull it over. Okay. I think that’s enough time. On with the review! Haha! Of all the Charley books, this one was the most “emotion-coaster-y,” meaning that I laughed, cried, and gasped out loud on more than one occasion. And, of course, I'd be remiss to not mention the steamy sexytimes. Man oh man, were they ever awesome. Because Charley is who she is, she doesn't always make the most sound decisions, but that keeps things very interesting. I'll admit that I was more than slightly worried about Reyes, but it was kind of cool because I've never really worried about him before. Yay for added tension! Haha! And speaking of tension, one of the things I liked most about EIGHTH GRAVE AFTER DARK was that it answered a lot of questions about why specific characters have been included in Charley’s posse--both alive and dead. In particular, one character’s purpose blew my freaking mind, but just when I thought I had it all figured out, everything got cranked up to eleven. The whole book was great, but the pace of the last third was bananapants, and the plot took a severe right turn, so kudos to Ms. Jones for sending Charley et al off into uncharted and incredibly dangerous territory for the next few instalments. And seeing that I’m one step away from being a (friendly and totally harmless) stalker, I saw on Ms. Jones’s website that she’s signed on for another three Charley books, so I can’t wait to read about what happens next! Given that the cover has skulls on it, I couldn't resist breaking out one of my glittery Halloween skulls. So if you read this review without having read the first seven (despite my warnings, you naughty little minx), what the heck are you waiting for? Get out there and crack some spines! Uh. Book spines, that is. All things considered, it's probably best to leave the cracking and/or slicing of actual spines to Reyes. You know, because of the whole murdery thing. Safety first, people! Haha! Ok that totally sounds like my type of thing!! Hooray for new series to start!! That book sounds pretty good. I'm so picky, but I like cozy mysteries. So maybe. LOOVE the nails! 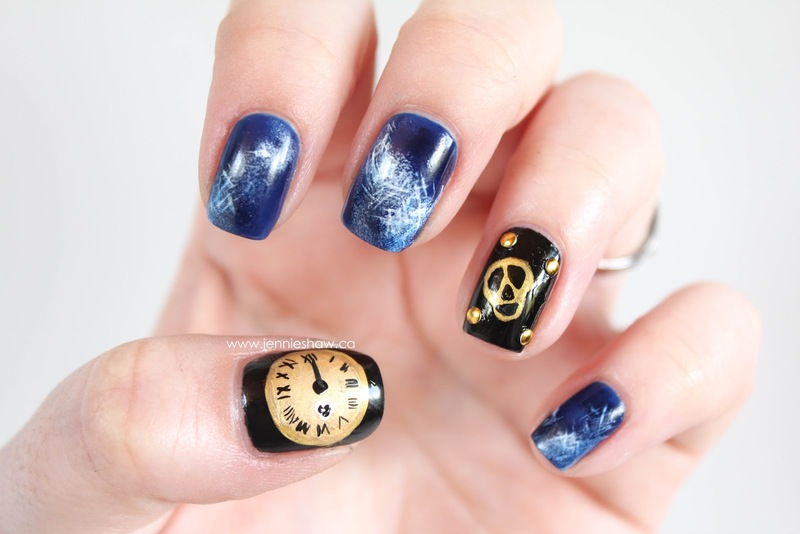 The designs look great and I freaking adore the effect on the blue nails!!! I haven't read the first book yet, so I had to skip your review (thanks for the spoiler alert!) but your nails look amazing! 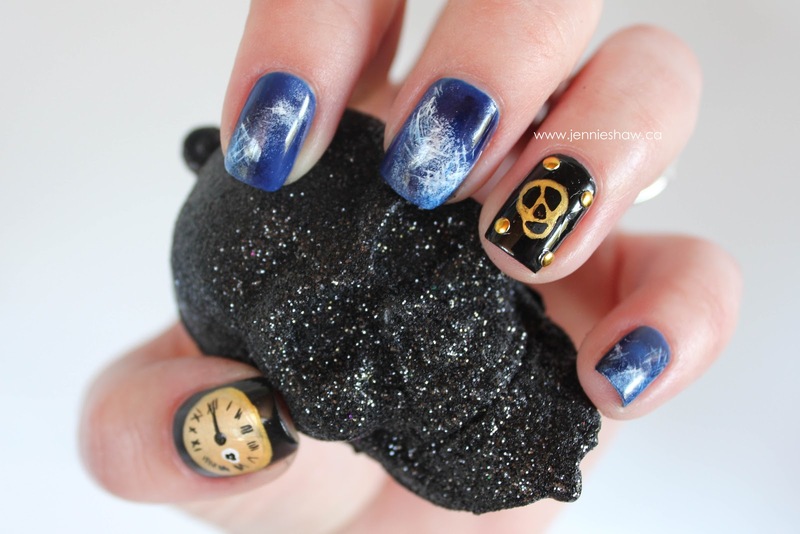 Did you freehand that clock? Seriously, your artistry skills are soooooo good. And I love the frosty affect (was that with crinkled-up cling wrap? ).